Even in ignominy or retirement, a big boy’s toys are worth playing with. Uralkali is Russia’s dominant producer of potash fertilizer and will soon merge with Silvinit to become the national potash champion, according to a government scheme first reported here on June 15. At the time, the head of investor relations for Uralkali, Anna Batarina, called this report disreputable nonsense. As far as potash champions go, it remains to be seen whether the Canadian government will allow BHP Billiton, an Australian-managed international, to buy out the Canadian champion, Potash Corporation; whether Potash Corp will apply for rescue by the Chinese champion, Sinochem; and whether the reigning Belarus champion, Belaruskali, will stay entirely under the control of President Alexander Lukashenko, or will be shared with either the Russians or the Chinese. The making and remaking of these potash champions will recast the global trading scheme for potash, which has been dominated until now by the Canadians through Canpotex, and by Uralkali and the Belarussians through the Belarusian Potash Corporation (BPC). Exactly how the Chinese will reorganize the terms of trade won’t be clear for a few more months. But reorganize them they are bound to attempt, for China dominates potash consumption in the world, followed by India and Brazil; naturally, they aren’t in favour of price gouging at their expense. 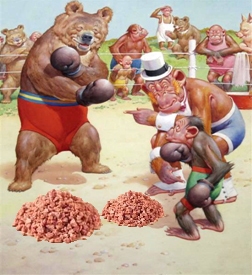 In the short run, the remaking of the Russian potash champion will make small fortunes for the arbitrageurs, Suleiman Kerimov, Alexander Nesis, and Filaret Galchev, who were assigned by Deputy Prime Minister Igor Sechin the task of seeing the founding and controlling shareholder of Uralkali, Dmitry Rybolovlev, out of the potash arena, and paying him out of this particular fight game forever. The full terms of this deal, and the final shape of the shareholding of the Uralkali-Silvinit combination, have yet to be fully decided and disclosed. But some details of the exit price Rybolovlev paid to leave Uralkali appeared in the small print of the company’s audited financial report for the first half of the year, issued on Friday. A year earlier, when Rybolovlev’s future at Uralkali looked like blue sky, the company’s financial report for the six months to June 30, 2009, had reported: “On 27 January 2009, the Group acquired a 100% stake in the share capital of Sophar Property Holding Inc., the only identifiable asset of which as of the date of acquisition was a contract for the purchase of a corporate business jet. The total purchase consideration for the acquired subsidiary of RR 753 [million](US$ 23,196,232) was equal to the net fair value of this contract. At 30 June 2009, the Group paid in cash RR 462 [million]; the outstanding amount of RR 291 [million] was included in other payables.” In other words, Rybolovev had arranged for Uralkali to start paying for his new toy on an instalment plan. How much more Sophar’s aircraft-buying on Rybolovlev’s behalf was to cost Uralkali was not reported then – or later. Depending on models and fittings, Falcon jets range from $25 to $35 million apiece. Uralkali’s accounting disclosures suggest that Rybolovlev’s second plane, the Airbus A319-113X (CJ), at about $100 million, was expensive even by Russian oligarch standards. 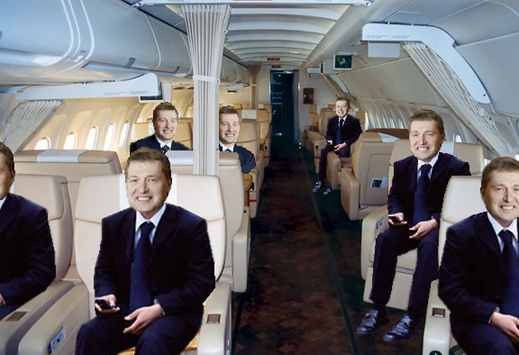 With extra fuel tanks for long-range flying, and special fittings inside (see image), Rybolovlev’s aircraft made its maiden flight on January 14 of this year, a year after Sophar had been bought by Uralkali. Six days later, the plane took off again from an airport in Hamburg; landed in Zurich to collect someone; took off again for Stansted in the UK; and then returned to Basel, in Switzerland, where the cabin interiors were decorated. The aircraft had been in the air for less than six months when Rybolovlev’s control of Uralkali crashed.